Treetop Adventure Huippu was opened in Leppävaara Sports Park, Espoo, two years ago in 2015 - and it is constantly developing. The most prominent novelty of this summer is 'Little Huippu' for smaller children. Little Huippu is a moveable wooden-framed adventure track with a platform height of 1.8 meters. There, small adventurers move in a secure harness. The Little Huippu stayed alongside the big Huippu until the Finnish Midsummer ("Juhannus"), and now it has been moved to Sello Shopping Centre in Leppävaara, Espoo. We experienced the treetop adventure as a family - two adults and two children (age of 6 and 10 years). We all had a great time! There are eight high ropes courses at Huippu. Three of the courses - the easiest ones - are located on the top of the hill and the rest five at the bottom of the hill. Those (at the bottom) may run up to 18 meters above the ground. When you come to Huippu for the first time, the adventure starts with a security training where the guides show how to use the harness and the safety system. All the adventure parks in Finland have their own security system that must be taken into account, for example, the belaying methods and the courses may differ from each other. Huippu has a continuous belay system. It means that all adventurers on Huippu courses stay fastened to a safety line at the starting steps of each course, and they stays fastened until returning to the ground through the final dismounting slide. You can always ask the instructors for advice at both the lower and upper courses. In this season every climber has a ring-locked handle that is attached to the harness, which maintains the frontal direction in the final dismounting slide of each course. We found it very useful. When you come to Huippu, it is good to dress for the weather in a comfortable outfit. The harness and a safety helmet are included in the price of the adventure. If you want, you can buy cheap climbing gloves from the ticket office. The courses are marked by different colours (green, blue, red, black) according to their difficulty. The green course is the easiest and the black course is the most challenging. Of course, also this year, one of us, Henri, had to experience the Tarzan swing! Free fall over Leppävaara is worth experiencing! You get extra advice for Tarzan swing from Huippu's instructors. Follow the security instuctions during the training carefully, and always ask if there is any question. Thread a pulley of your harness into the zip wire at the beginning of each course. Do not hold the cable at the final dismount slide. Make sure the previous adventurer has left the landing area. Ask the staff to check the tension of your harness if you suspect that it has loosened. 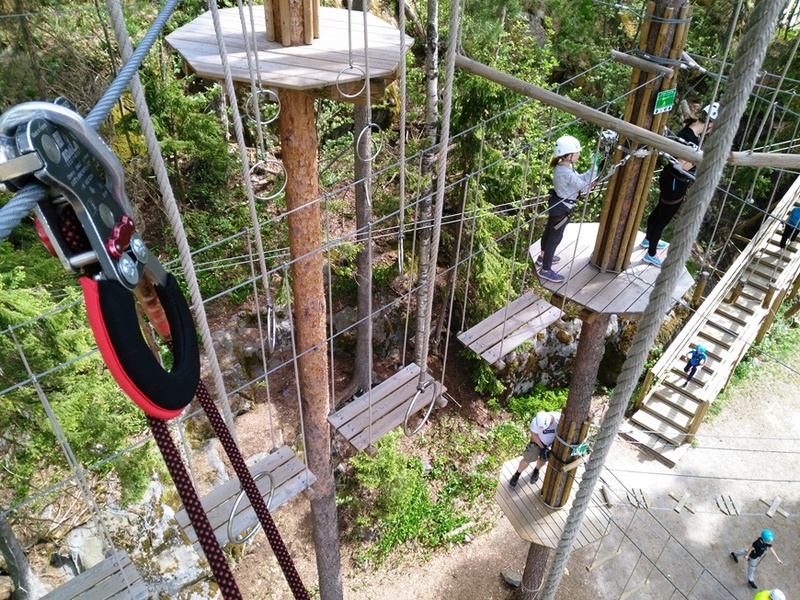 Adventure day in Huippu, which is one of the biggest treetop adventure parks in Finland, is a nice experience for the whole family. Also the rest of Leppävaara Sports Park area with its summer oasis - Leppävaara lido, Angry Birds playground and a 1,700 square metre skatepark is worth a visit. Shopping Centre Sello and Leppävaara railway station are located about 2 kilometers walk away from the sports park. Treetop Adventure Huippu is a Star Destination and media customer of LikeFinland.com media.